Yes! 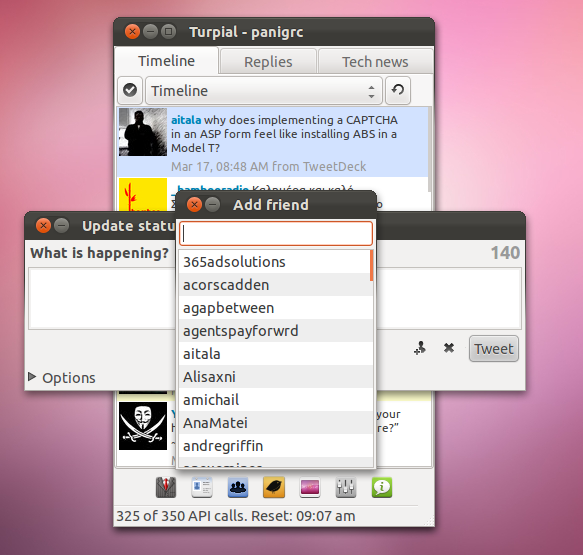 Turpial is a very lightweight twitter client that you can load on your netbook without fearing that will consume all your memory. Believe me other twitter clients like Tweetdeck look fancy but use lots of CPU power and memory which is vital for your 1 GB of memory netbook. 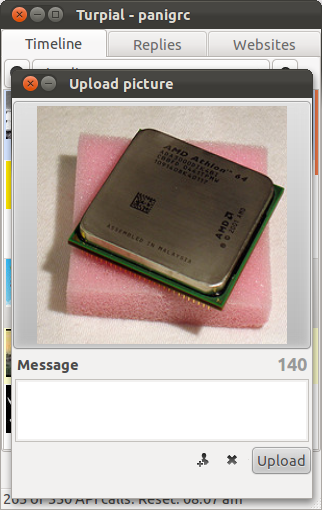 For you who are a bit more tech savvy Turpial uses only about 45 MB of memory. The interface is pretty straightforward. In the one column mode you can see the other columns by switching the tabs. Also you can find all the basic functions at the bottom of the window. 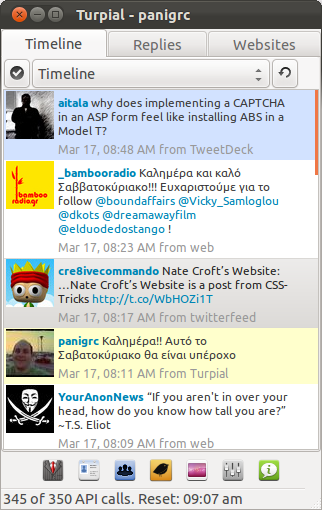 The status bar shows the remaining API calls to twitter. 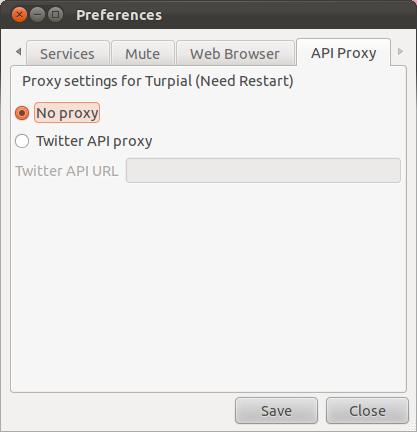 It means that if you use all your API calls then Turpial won’t refresh anymore. An API call is consumed by each action you do. For each tweet, each refresh, each retweet. Notice this happens with all twitter clients, because twitter gives a certain amount of API calls each hour for you. This is a measure to prevent overloading of their infrastructure. 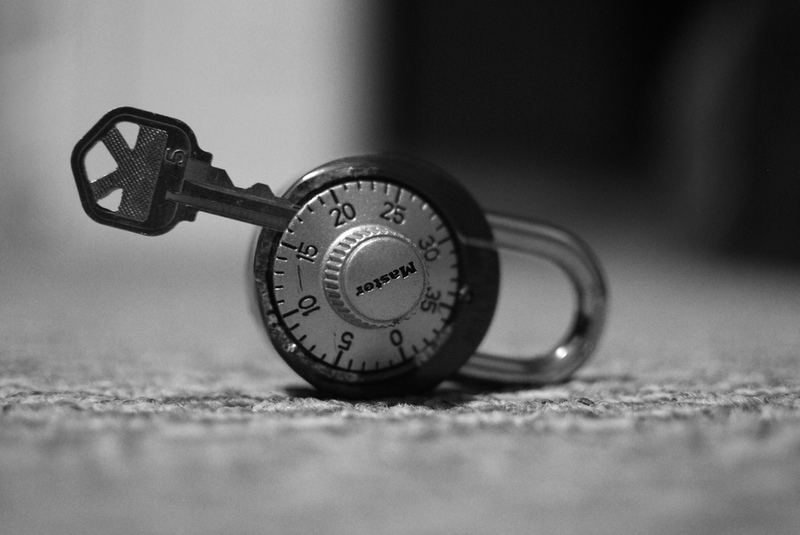 But don’t worry, you cannot run easily out of calls even if you refresh your twitter feed every minute. 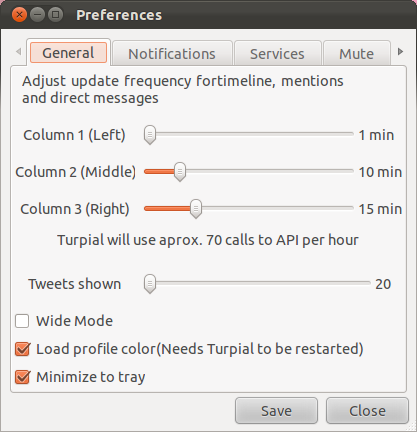 As I mentioned before Turpial has three columns for you to use. Yes I now that Tweetdeck for example has the ability to add more columns but we want to k.i.s.s. it! At each column there is a drop-down menu where you can select the content of the column. But also your lists you have on twitter. If you want to mention some of your friends (the people you follow) then clicking the “Add Friend” displays a list of those people so you can insert them into your tweet. It is very easy to post a picture from Turpial. Just click in the middle and the browse window will appear to select a picture. 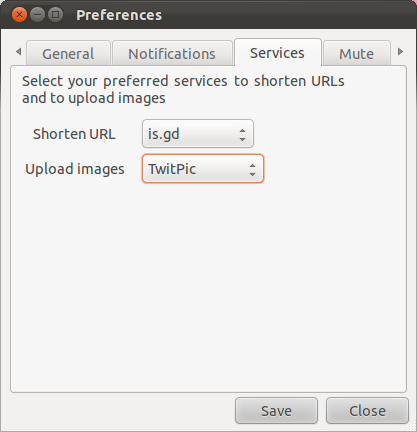 Also as you will see below at the preferences you can choose what image upload service you want to use. You can see your status directly from Turpial. Number of tweets, followers and following. You can edit your account details and see your favorite tweets. I call it Super because right clicking on a tweet you can do almost anything. Notice that the Open Menu opens a sub-menu with all the links mentioned in the tweet and clicking on one of them opens the link in a browser window. else you can find installation instructions at the Turpial Download website here. 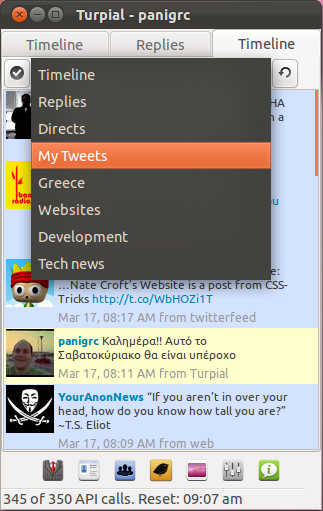 Which twitter client do you use (if any) ? 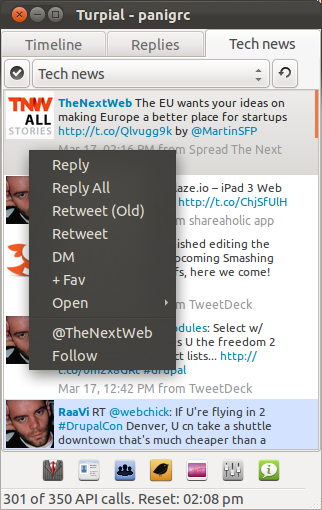 Share your experience using any twitter client, now or in the past, desktop or web based. Nice review! 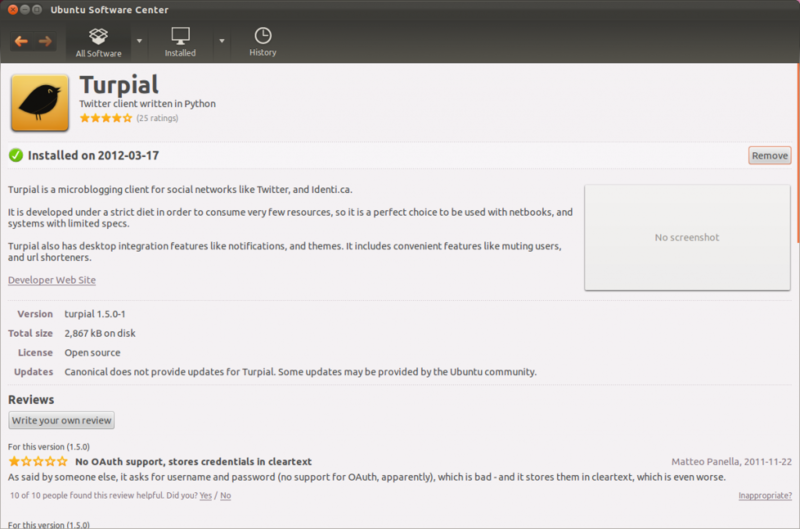 Turpial looks nice, but I wish it had unlimited columns like other clients. Thanks for your comment! Alex you are right, Turpial has limited number of columns, but considering the amount of memory it uses it’s a lightweight solution that even if you have an old pc or laptop you could still run it. Which client do you use by the way ? I’m using Hotot now. 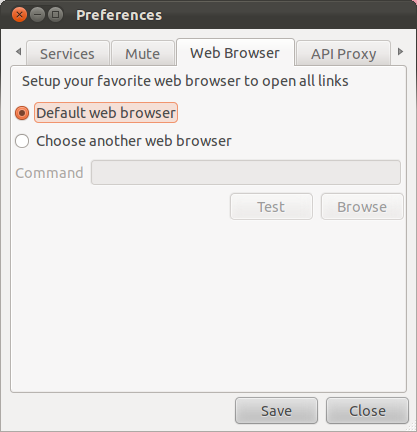 I’m actually using the Chrome extension, but it’s also available as a standalone Linux program. The Chrome extension uses more memory, but it’s a version ahead of the standalone release for some reason. Broken API, like all the other twitter clients that have not updated today. Ashley, do you still have problems with your twitter client, because I am using Turpial and it fetches the tweets with no problems. I have not seen an update lately … which version are you running? Dear Ross, I am not currently using any twitter client. 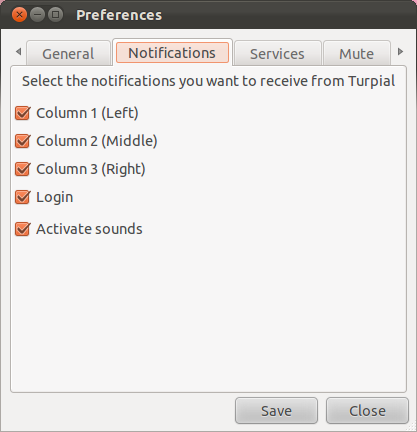 But I will give turpial a try, because last time (before 6 months :P) it worked fine. 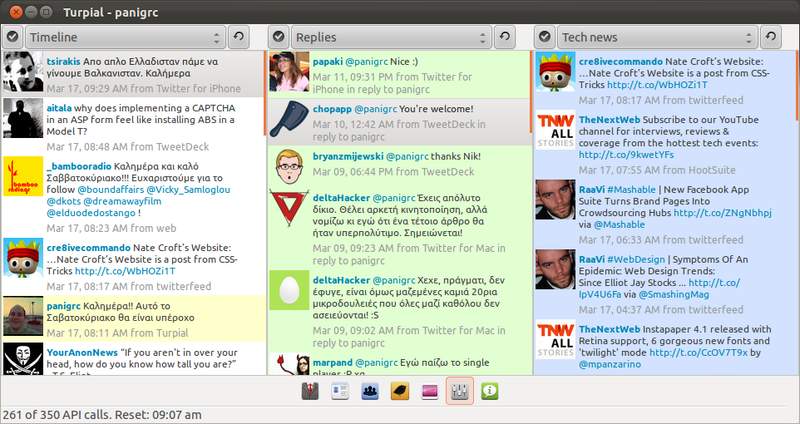 Also I think that tweeckdeck which is now owned by Twitter has to be working. Anyway, with which twitter client do you have still problems to check it out. Turpial, to be precise. 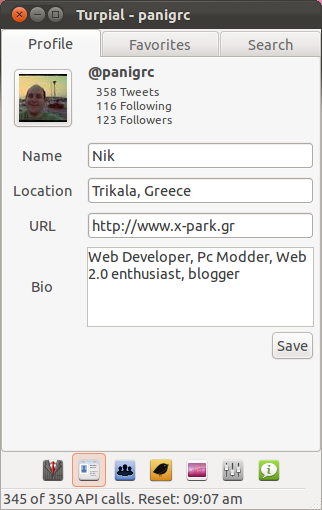 Choqok is working with the new Twitter API, but Turpial still not in anything beyond a beta version.